Coal is a naturally combustible solid that is still an important fossil fuel especially for generating electricity. Coal is classified by hardness and carbon content as anthracite, bituminous coal, sub- bituminous coal, and lignite. 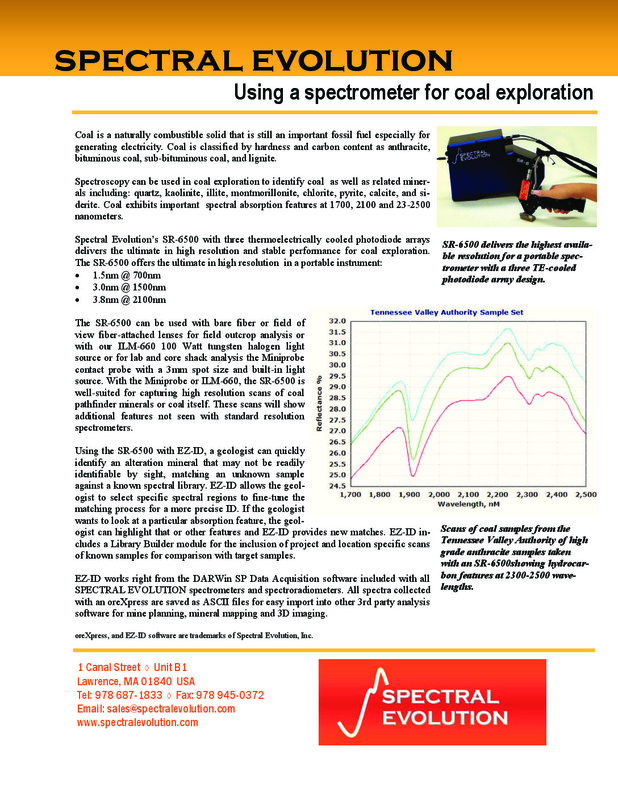 Spectroscopy can be used in coal exploration to identify coal as well as related minerals including: quartz, kaolinite, illite, montmorillonite, chlorite, pyrite, calcite, and siderite. Coal exhibits important spectral hydrocarbon absorption features at 1700, 2100 and 2300-2500 nanometers. The SR-6500 can be used with bare fiber or field of view fiber- attached lenses for field outcrop analysis or with our ILM-660 100 Watt tungsten halogen light source or for lab and core shack analysis the Miniprobe contact probe with a 3mm spot size and built-in light source. With the Miniprobe or ILM-660, the SR-6500 is well-suited for capturing high resolution scans of coal pathfinder minerals or coal itself. These scans will show additional features not seen with standard resolution spectrometers. 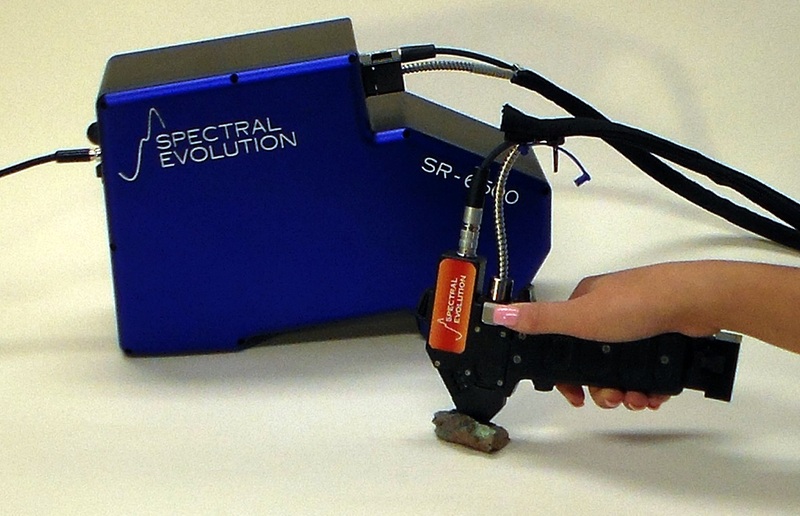 Using the SR-6500 with EZ-ID, a geologist can quickly identify an alteration mineral that may not be readily identifiable by sight, matching an unknown sample against a known spectral library. EZ-ID allows the geologist to select specific spectral regions to fine-tune the matching process for a more precise ID. If the geologist wants to look at a particular absorption feature, the geologist can highlight that or other features and EZ-ID provides new matches. EZ-ID includes a Library Builder module for the inclusion of project and location specific scans of known samples for comparison with target samples. EZ-ID works right from the DARWin SP Data Acquisition software included with all SPECTRAL EVOLUTION spectrometers and spectroradiometers. All spectra collected with an SR-6500 are saved as ASCII files for easy import into other 3rd party analysis software for mine planning, mineral mapping and 3D imaging. 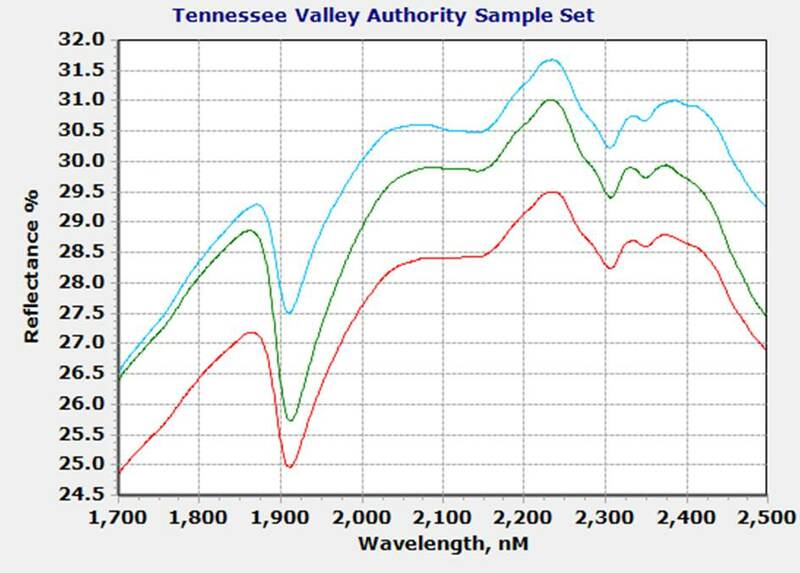 Scans from the Tennessee Valley Authority of high grade anthracite from three mines taken with the SR-6500 spectroradiometer. The SR-6500 delivers the highest resolution available in a portable spectrometer.